Thanks Krista – appreciate the thumbs up for puff pastry. So pleased you’re still making it now and then. It really isn’t difficult once you understand how it works. 1) Lately I’ve been buying a butter that has lower water content. Will that be a problem with this recipe? Is it the water in the butter that creates the steam or the fat? 2) How much pressure do I use on a rolling pin? 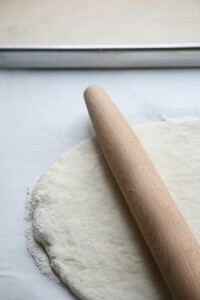 I have one like in the picture, but there’s something about rolling out dough that makes me tense up — my biceps become like bolders and my shoulders tense up because I just don’t know how much force to use. Oh, and something that often baffles me — what temperature is room temperature? Thanks for dropping by, Nancy. Lots of people suffer from Pastry Anxiety but if you take it slowly, there’s no need to tense up. You CAN master this. 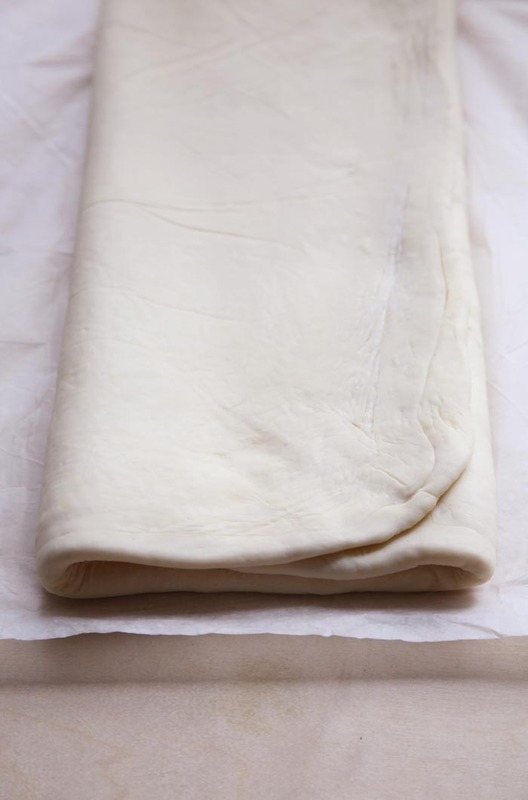 My first attempt at puff pastry, at culinary school, was a disaster. We had a limited time to make the dough and I was so rushed and tense, I over-worked the dough until it was too tough to roll. My pastry came out of the oven flat and greasy while everyone else cheered their beautifully puffed pastry. The next time I attempted it, I was at home and it came out glorious. 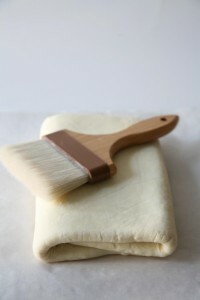 All to say, puff pastry can be a relaxing art when you’re not rushed. I often make it over a day or two. Butters with a lower water content are actually better for pastry so you’re in good shape. 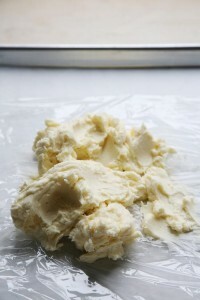 I use European-style butters because they have a higher fat content (around 83-86%) with a lower water ratio. That said, I’ve experimented with all sorts of butter and find technique trumps water content. 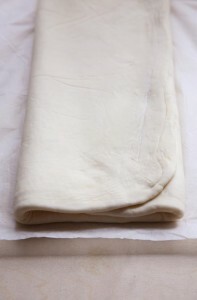 It is the water from the butter that creates the steam that pushes up the pastry to create those lovely layers. 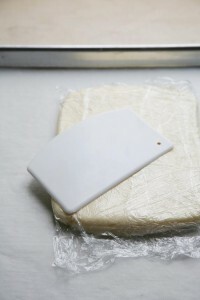 Relax those shoulders when rolling out your dough and apply only enough pressure to flatten the dough. 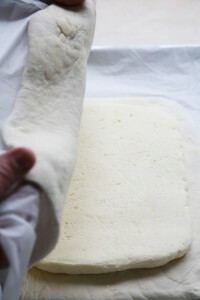 If your dough is difficult to roll, it’s because the butter within is too cold and firm. 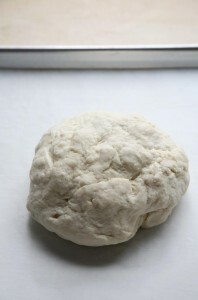 Leaving your dough on the counter until the butter has warmed and softened will make it easier to roll. Room temperature is a comfortable temperature about 20 Celsius. Good luck Nancy. I’d love to hear how you make out. Got it, thanks. 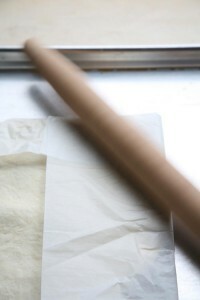 I looked at your photo and see that your fingers were kinda splayed on the ends of the rolling pin. I tend to grab hold of mine (like bike handlebars), so I’ll modify how I hold it. I really appreciate your taking time to answer these questions for me. I’ll let you know how the puff pastry turns out. 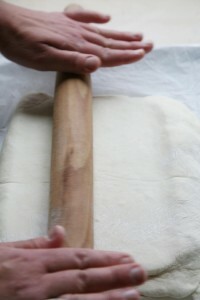 A French tapered rolling pin, like the one above, is used with the palm of the hands. I prefer it to standard rolling pins because it offers more control. If you’re grabbing the ends of a tapered rolling pin, you’re dragging it over the pastry rather than rolling it. Think rolling pin, not dragging pin. Wow, Nancy’s questions and your answers, Denise, are so helpful. I’d been feeling a bit nervous about trying this recipe but think I’ll give it a try soon. Thanks! It’s the brave soul who raises their hand with a question that helps everyone else in class. Do give it a try Nancy (the other one)! 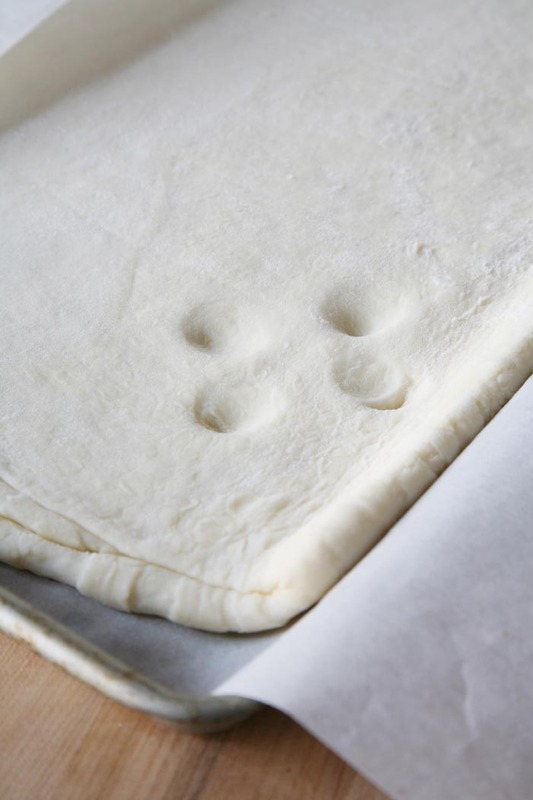 If you’re patient and follow the instructions, you’ll be rewarded with the best pastry imaginable. I’ll be here to cheer you along the way.